Moor Pond Woods is the site of a system of reservoirs and channels (called leats. ), constructed in the eighteenth century by the Robinson family to serve their extensive cotton processing activities along the Leen valley. North of Linby Lane was a reservoir called Upper Pond (also known as Papplewick Dam). 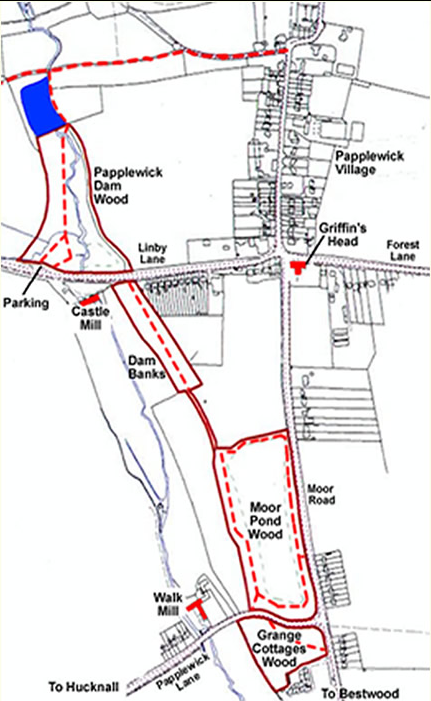 Moor Pond was between Linby Lane and Papplewick Lane, and a third reservoir was between Papplewick Lane and Grange Cottages. Water was taken from the River Leen and fed into the ponds along a series of ‘leats’. Water from the ponds was released, when required, to feed the waterwheels at Castle Mill and Grange Mill. A historical review of the mills is found elsewhere in the website. Since cotton refining finished in 1828, the site has slowly returned to nature. The woodland is a designated local wildlife site, with mature ash, oak and chestnut trees. There are more than twenty species of bird regularly observed, along with bats, crayfish, water voles and a rich assemblage of invertebrates. As well as the pond and the woodland there is an extensive area of wetland. The site is owned by the Co-operative Society and managed by Nottinghamshire County Council’s Conservation Service to allow public access. In consultation with the ‘Friends of Moor Pond Woods’, they help to maintain the wildlife interest and maintain the footpaths for local walkers. and to restore and interpret the archaeological features of the site. In partnership with Nottinghamshire County Council’s Countryside Management team and the Greenwood Community Forest team, the Millennium Committee produced the initial action plan. to create a new footpath to allow circular walks around the site. Support for the proposals was gained from the ‘Corridors to the Countryside Group’, a local collective of organisations interested in the management of access and wildlife corridors situated near Nottingham’s rivers. Organisations represented include the County, City and District Councils, the Environment Agency, the Countryside Agency, the British Trust for Conservation Volunteers and the Greenwood Partnership team. The Local Heritage Initiative (administered by the Countryside Agency) initially awarded a £7,000 grant to fund the feasibility study (ecological management plan and archaeological plan), and a further £15,000 to explore and conserve some of the archaeology. PowerGen (now e -on) granted funding to clear invasive waterweed from the pond. Gedling Borough Council and Ashfield District Council awarded grants to improve disabled access to and round the site, and provide seating. Nottinghamshire Community Foundation and Rural Community Council awarded grants to improve paths around the site, and provide interpretation boards. Small awards from ‘BBC -Breathing Spaces’, BTCV, Nationwide, Prudential, Wildlife Trust Greenwood and the Sherwood Forest Trust were received for various habitat projects.